What Exactly Is Low Price Egg Tray Making Machine? Price is a major concern of investors. Even more, it matters whether we purchase something or not. But the first thing is to understand what low price egg tray making machine is. On the one hand, the scale of a paper egg tray machine makes a great difference in its price. The larger the scale, the high the price. If you want to invest a low price egg tray making machine, you’d better choose a small-scale one. A small egg tray making machine is suitable for first or small-scale investors. Except for low costs of an egg tray machine, it also takes less occupied areas and workers. Beston Machinery has 4 types of pulp forming equipment for sale. We employ the most advanced technology and exquisite craft. Therefore, it can save more time and expenses on maintenance as well. On the other hand, the automation level also largely influences the egg tray machine price. The higher the automation degree, the higher the price. If you plan to invest a low price egg tray making machine, you can choose a semi-automatic one. 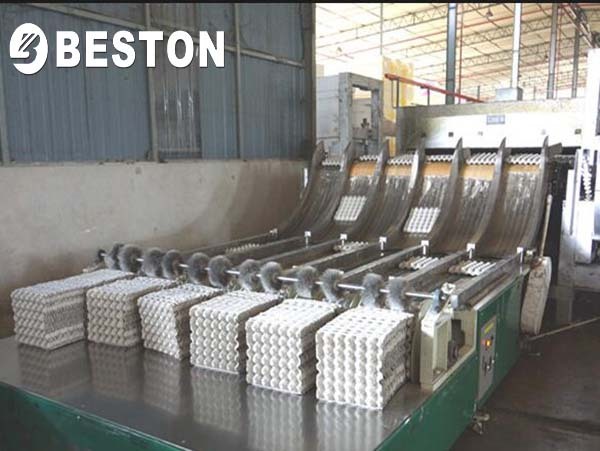 While both semi-automatic and fully automatic egg tray making machines are available in Beston. Besides, our molding system of both semi and fully automated types, the most complex and core part, is completely automatic. Hence, both of them are very easy and safe to operate and maintain. What Steps and Processes Are to Produce An Egg Tray? Investors often pay more attention to the return on investment. A suitable plan needs to make full use of your available resources, including your weather, labor force, fuels, etc. That’s why the egg tray making machine price is not the exclusive measurement. To well understand the working process will be beneficial to get a low price egg tray making machine. A complete egg tray production line often contains four sections, namely, making pulp, forming, drying and packing. Each step plays different roles, but they connect each other closely. In other words, the coordination of each part is also influential. The first step is breaking waste paper into pulp. A good pulping system can constantly transfer pulp to egg tray forming machine to keep a proper operating speed. Moreover, an applicable pulping line needs fully utilize the landform of your factory. For one thing, it can save much money on construction works. For the other thing, the structure of your plant will be clear and safe. What a mess it will be if you have an unreasonable pulping system! 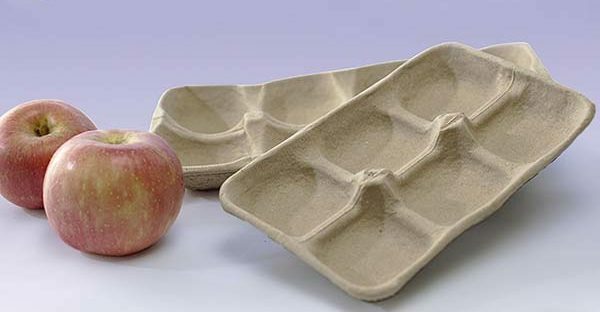 Molding system will shape paper pulp into various paper trays. Paper pulp forming machine is the central mechanical equipment. Certainly, a reliable egg tray making machine can make the utmost of energy to improve the working efficiency. Meanwhile, the failure rate can be greatly reduced to save more repair charges. 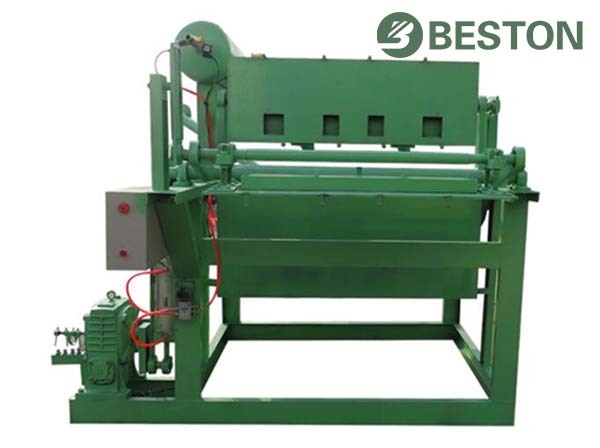 Beston Machinery can supply you the top-quality paper tray molding machines at a reasonable price. These two systems often reflect the automation level of an egg tray production line. There are many different modes and machines to choose. After demolding, the wet products will be dried first. Actually, the drying speed matters the output of pulp molding products. Natural drying is cheapest in equipment, but it requires good weather, large space and more labor force input. Imagine what will happen if you dry your egg trays naturally, but you always have a terrible weather? We have another three effective drying modes. In addition to the drying efficiency, different drying lines are suitable for different solutions. 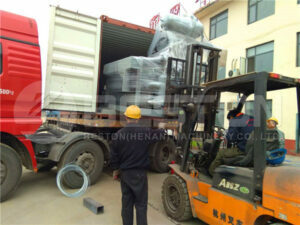 We also have various choices for packing system. For example, you may just need a packer to help you pack egg trays compactly. While you’d better employ a hot press during an egg carton manufacturing process. If you have a BTF-5-12 egg tray making machine, you may also want an automatic counter and packer. Each piece of equipment has its own roles. You can get the most cost-efficient investment plan if you know clearly the egg tray making process. All in all, you can invest wisely and independently if you well understand the role of each section and the relationships between them. 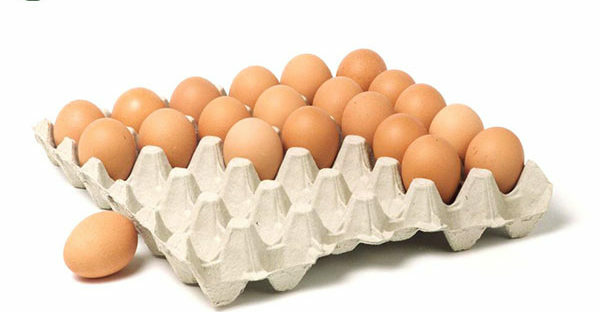 However, if you want a suitable egg tray production line more easily, please contact Beston right now. 1.We have a wealth of manufacturing experience to offer you the low price egg tray making machine with great performance. Beston Machinery has focused on pulp molding machines for about 20 years. Our pulp molding production line is getting complete and mature. For now, we can produce various pulp tray molding machines for apples, shoes, seedlings, etc. You can customize the size and design as well. 2.Our professional engineers will analyze your conditions carefully. Then our design team will provide you a specific blueprint. We can also install the equipment if you need. You can enjoy an easy and effective shopping experience. 3.You know you can buy a low price egg tray making machine from China. But you may worry about the high shipping costs. Never mind. We also have rich exporting experience. Our multilingual sales managers will supply you a satisfactory solution. Beston has a lot of regular customers from all over the world because we always do more than products. Welcome to contact us!